Here is my first image taken with the new Astro-Physics 1100GTO mount. I am in the process of building up two imaging rigs to run in parallel. This new mount is intended mainly for my Celestron 11" EDGE + FLI ML16200. My older, but no less loved AP Mach1GTO is intended for my smaller scopes, mainly the Tak FSQ-106 and my QSI 683. I am in the middle of long term plans to get an even larger-sensor CCD for the bigger system, but these are multi-year plans due to the expense. For this first time out with the 1100, I actually used the smaller QSI 683 camera as the ML16200 was in need of service. The only report I can give on the new mount is that it worked so flawlessly that after a short time I forgot that it was there. I am hoping that it will hold my FLI camera more steady with my C11 than the Mach1 did. There has been enough play with that scope on the smaller mount that the large cooling fan of the camera was inducing a small vibration, unfortunately large enough to cause the stars to look like little squashed doughnuts. From what I can tell with the QSI 683, the stars are reasonably round. But, I did use my Celestron 0.7x focal reducer, and this does not produce round stars, particularly towards the edges of the field, however I was pleased enough with the results. My biggest disappointment in this image is that I failed to predict the bad seeing conditions during three of the four nights of imaging, and as a consequence I did not get enough adequate L frames from which I rely on the resolution of detail. In retrospect I should have devoted as much of the first night as possible acquiring just the L frames during good seeing conditions and then acquiring RGB the other nights when poor seeing prevailed. I only have a little over an hour's worth of L data, but 2 hours each of RGB. I would have loved to have had more like 6 hours of L, but it didn't work out that way. I have many hours of lousy L data, none of which is suitable to mix with the 1 hour from the first night. 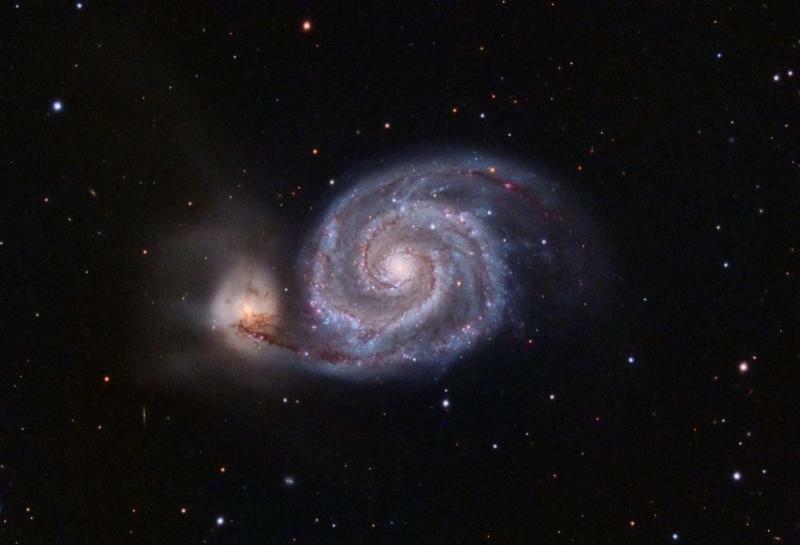 It is my hope to return to M51 real soon and collect better data. But, since this is a first light image with regards to the new mount, I wanted to post it anyway as many of you would be interested in my plans. Your C&C are most welcome, but you need not bother fussing at me about the amount of noise in this image because I am painfully aware of the lack of integration time. I'll try for another image later this season, particularly when I get the ML16200 back up and running. No worries, you'll get no criticism from me. I actually like your image quite a bit. Colors all correct, details all there. What have I to complain about? Congratulations Ben...both on the new mount and on the image. In spite of the mediocre seeing and the lack of integration time, that looks like a fine way to start out. Well done! I think that your problems with vibration are in the past. I've had this same funny experience on numerous occasions with galaxy images where I go through the steps of saturating the colors so that I can brighten them up. I incrementally apply the saturation (such as using CurvesTransformation in PI) until the image gets to the point where it starts to look like a Thomas Kinkade painting. Then I dial it back a bit, but I often still think I've gone too far with brightening the colors. And then I peruse other images of the galaxy on the internet and come to realize how dull mine is in comparison. It's all a matter of taste, of course. Looking back at my image now it looks much more quiet and subdued than before. The true test will be to put the ML16200 on the C11 on top of the new mount and pray that mongo fan doesn't cause round stars to look like tiny race tracks. I didn't post any real review of the new mount. Here are a few words. There are several features that immediately impressed me. First, combined with my new portable pier, that thing is tall. I have a step ladder that I use to access the top of the scope when it's in Park 3 position, and I'm on the short side, so reaching, say, my secondary mirror focuser is challenging. I now really need to go to Park 2 or, even better, Park 4 to get better access. Second, I really like the Alt/Az adjusters on the 1100. The Alt adjuster is a captain's wheel knob that makes polar altitude adjustment even easier and more precise than on the Mach1. It is a bit harder to have to loosen four side bolts to move the Alt adjustment, and that can throw off the Az adjustment, but I've figured out that it's best to get the Alt where I want it first, lock down those knobs, and then adjust Az. Third, through cable management is even better than the Mach1 because there's an insert that goes into the tube portion of the base RA section that keeps the cables out of the sight line of the polar scope. This was a problem for me in the past with the Mach1, where I had way too many cables that got in the way of the polar scope. I've since reduced the number of cables greatly, but the 1100 is even better with this insert. A small negative for the 1100 is that it takes quite a bit longer to set up. It has 6 screws at the base to attach to my portable pier. I need to separate it into its two sections, and I haven't learned how to connect them quickly. It's a little bit tricky. The same is true of the top plate on the DEC section. Everything fits together well, but you have to learn a precise way to couple all the pieces. I'm sure it'll become second nature to me soon. Edited by BenKolt, 22 March 2019 - 01:34 AM. Excellent image, Ben. The 1100 is a stalwart mount that should carry your 11" Edge with no sweat at all. In the same stretch of clear skies, from my rural skies here in Snohomish, I was working on a project with my RCOS 10" RC scope at 0.27"/px (I am aware that is crazy) and the 1100 did not even break a sweat tracking and guiding like a champ throughout the course of 20 hours of data collection. Use the new Park 5 position. I like it quite a bit. Also use the free copy of PEMPro you received for good polar alignment. Edited by rockstarbill, 22 March 2019 - 02:58 AM. Congrats on the new mount and the great looking image Ben. I'm really hoping for more time soon to image M51. It's such a beautiful grand design spiral that I can only imagine others have imaged it in the past ... but I'd like to get more integration time on it under (hopefully) better seeing conditions and maybe soon with my 16200. How were your seeing conditions during our last series of clear nights earlier this week? As I've been moaning about, mine deteriorated from average, maybe even above average, to poor from the first to the next nights. I also gathered quite a bit of data on two different targets, mainly this one, but most of my L data is abysmal. Maybe the atmosphere was kinder to you in Snohomish! I've never used the PEMPro polar alignment routine, but others have said it's great. You know, I've heard of Park 5 but still don't know what it is. I have my gear set up inside now and will park it at Position 5 and see for myself. Thanks! I tried to bring in the "best" of the L data from the lousy nights, and the image resolution deteriorated with only little improvement in noise. I went from 1hr 9m of good data to 4hr of mixed data and saw an improvement of standard deviation of stacked image go from 273 ADU to just 225 ADU, and with my stars almost doubling in size. Ideally I should have seen the noise cut in half with more good data. I'm hoping for more time! The seeing here was okay, some other imagers were reporting really poor seeing on the Eastside though, to the tune of like 5-6".